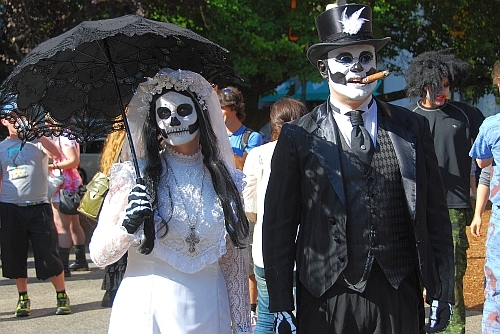 A friendly mob of zombies flashed upon Robson St. today as hundreds — if not thousands — of people dressed up for the occasion. 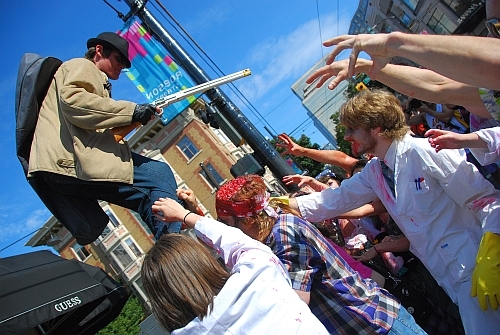 It was my first time witnessing the Zombie Walk and I thought it was entertaining. Only a few costumes were especially gory — like the bottom right picture you see above — with most being “playfully” scary (in my adult opinion anyway). 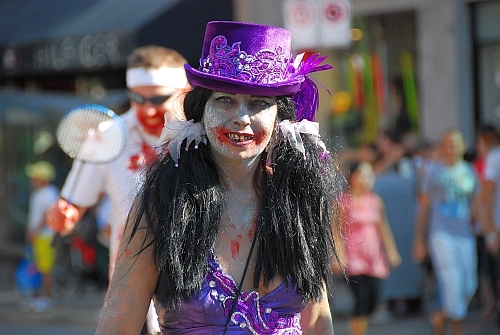 Not having read much about that walk beforehand, I was expecting only a small group of people to roam Vancouver’s busiest street, but I was surprised as a steady stream of zombies invaded Robson St. for about 10-15 minutes. Even after the main group was through, we had to dodge many more of them on the sidewalk. I’m looking forward to the next one (as a photographer :) ).